As in years past we are getting ready to celebrate Three Kings Day or El Día de Reyes. Last year we hosted our very first cultural playdate. This year I didn’t plan to have another Three Kings playdate, but I couldn’t help but use this theme for little one’s very first Spanish playdate! (More about that in another post). 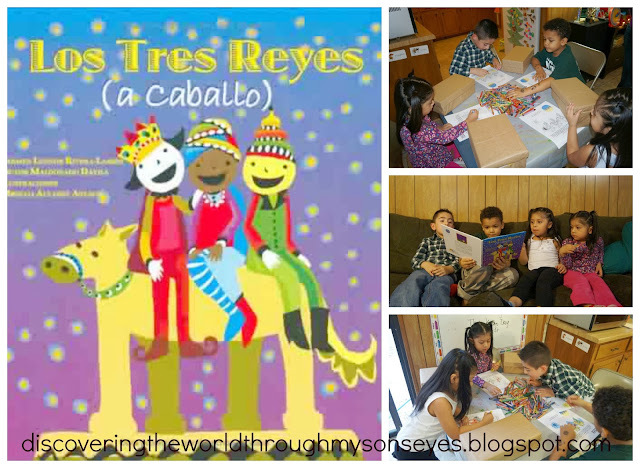 We read the Los Tres Reyes (a caballo) Spanish Edition. This is a sweet and old tale of how the Three Kings arrived on Puerto Rico! They reach the island by flying on a cloud, and with the help of a horse they visit all the children’s home delivering gifts on the eve of January 6. I love the simplicity of the story, and the colorful images that captures the littles attention. To keep them entertained, I made copies of the Free Christmas Coloring Book in Spanish From Bebe Lanugo from Spanglish Baby and the children colored “los reyes y pastores” coloring sheet. Then for the fun part! 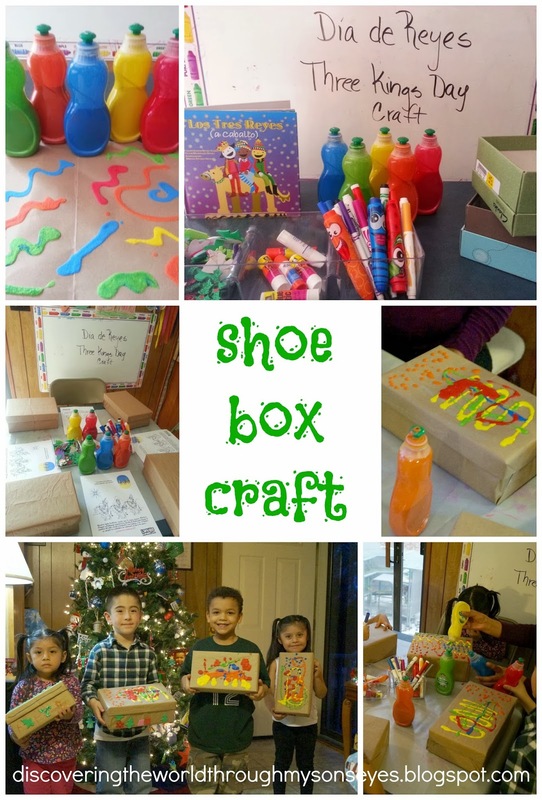 Decorate a shoe box! They used puffy paint, stickers, and markers to decorate the boxes. The shoe boxes are said to be placed under the child’s bed with grass/hay for the camels or horse, and some water. The Three Kings in exchange will leave behind gifts, and treats for the little ones. Do you celebrate El Día de Reyes? Let me know! Comment, like, share or pin! I love this post. I love this craft and I really am in love with the idea of themed playdates. WOW! What a great idea for homechoolers. Thank you so much for sharing. I am pinning this craft project. I don't know much about 3 kings day, but perhaps we will get out and learn.